Read the left and right panes before scrolling down to the next levels. Click links to view related photos, use your back browser button to come back to this page. The first settlement in the area now known as Lutz was a Catholic mission started in the late 1880's by Luxembourg Catholic priest Francis Xavier A. Stemper. Stemper bought quite a bit of acreage on the west side of Lake Bruing in section 13 of township 27, range 18 east for the purpose of starting a Catholic colony. Those who settled in the Stemper colony were not Germans but people from the small country of Luxembourg. Luxembourgers are often confused for being German because of the language they speak. They spoke Letzebuergesch but this is not a written language, so all Luxembourgers also read and write in German. Thus, they are often misclassified simply as Germans but they are a distinct ethnic group. The Stemper post office was established on Nov. 17, 1893 with Stemper as the postmaster. Henry Sabel succeeded him as postmaster in Oct. of 1897. The post office was ordered discontinued on Feb. 9, 1899 but reestablished on April 13, 1899 with Frank Binsfield as postmaster. The area is located along present day US 41 south of present day Sunset Lane to DeBuel Road. About 2/3 of this section is east of US 41, and about 1/3 is west of it. The colony was located across from the swamp from where the First Baptist Church of Lutz now stands, on the east side of present day US 41. The road that now crosses the railroad tracks there was then called the Bruing Crossing. The lake was soon renamed Lake Stemper, as it remains today. The first structure Stemper built was the church which doubled as the school. 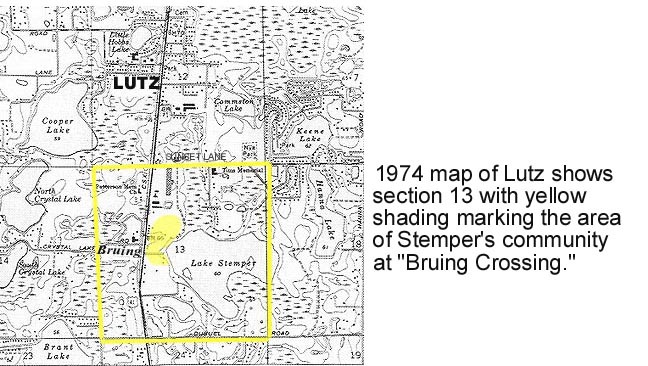 It was on the northwest end of Lake Bruing which was then renamed to Lake Stemper. A cluster of houses soon sprang up there, and a cemetery on what is now Cypress Cove Road. This house was built in the late 1880's in the Stemper settlement. 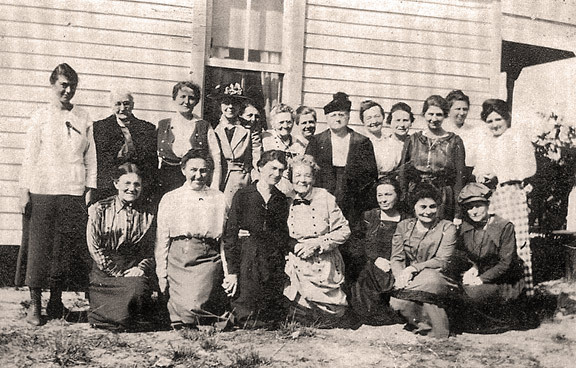 Women in Father Stemper's congregation on a Sunday morning, circa late 1800s. Fr. Stemper, to the right of the window, is wearing a black biretta and robe. Stemper is a very popular Luxembourgish surname. Relatives of Fr. Stemper still own a huge religious goods store in Milwaukee, the T.H. Stemper Company. 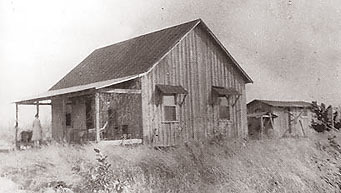 Stemper school was in operation for several years. German immigrant children sat side by side with local Florida "crackers." Classes were separated by gender. The boys were taught by Father Stemper himself and the girls were taught by a "Miss Nelson." The old Stemper colony dwindled away in the early 1900's, but thrived again a few years later as people moved there to work in the turpentine industry. Artifacts from the old Stemper colony can still be found in the woods, swamps, back roads and even under the front yards of some of the local residents (namely, the old cemetery.) None of the buildings remain today, but some of the lumber from the old church was used to build the garage of a local resident. 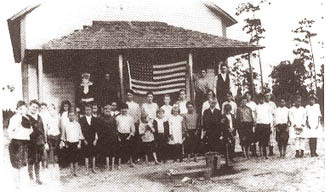 "Stemper A School" seen in the photo at left circa 1910's (after 1912 since there are 48 stars on the flag), opened after the Stemper settlement closed. Those who remembered it said the teacher would ride her white horse to school every day from Lake Magdalene. The earliest industries in the area were sawmills and the manufacture of turpentine. Turpentine was made by drawing sap from trees and and distilling it in large stills. It was then used as a fuel. 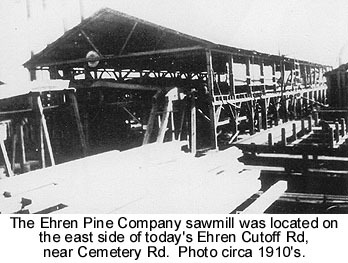 As early as the 1880's, Frederick E. Müller ran the Ehren Pine Company sawmill in an area of Pasco County known as Ehren. Named by Frederick and his brother Louis, "Ehren" means "place of honor" in their native German tongue. The stagecoach relay station at Ehren was called "26 Mile House." The Ehren post office was established on Jan. 17, 1890. According to the 1900 census, Frederick Müller was age 36, born in Germany in 1864, and listed as the sawmill's proprietor. His wife Emma and his children Casper, Carl and Edna were all Floridians. The Müllers lived lavishly in a large 2-story house across from the sawmill; they even had maids. (The house was so large that the census enumerator listed it as a hotel, though according to old-timers, no locals ever stayed there or set foot in the house.) Guests were limited to Müller's foreign friends and visitors. 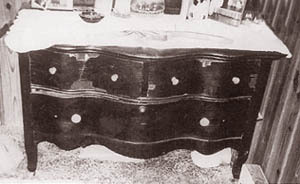 A fire burned the house in the 1920's, only a piece of furniture, a dresser, survived. Young and old alike worked hard at the Ehren sawmill. The mill employed bookkeepers, machinists, engineers, laborers, clerks, sawyers, foremen, log yard workers, teamsters, mill hands, swamp foremen, and swamp workers. Sixteen-year-old Clarence Lutz worked there as a clerk. His father, Charles Lutz age 41, was a superintendent. By 1909, Charles would have his own sawmill in Odessa. 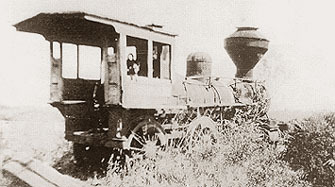 Müller used a tram road to run turpentine and lumber to the Orange Belt Railway that was built in 1888. He also supplied lumber and turpentine to the Stemper area in the 1890's. Pine Co. sawmill, circa early 1900's. 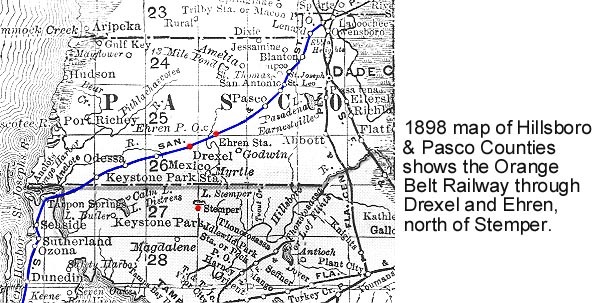 The Orange Belt Railway was a narrow gauge railway running from St. Pete through Odessa, Drexel and Ehren to Trilby, Florida. It was used primarily to haul logs and lumber, and sometimes passengers. It became known as the Sanford and St. Petersburg in 1893 and was absorbed by the Plant Railway in 1895. Plant transformed it into a standard gauge railway and the first standard gauge train passed through on January 19, 1896. 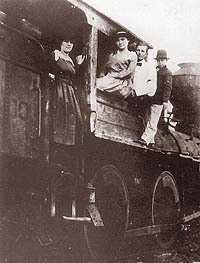 The train's engineers in 1900 were John Henesay and 26 year old William Lutz. John Clark, 43, was the fireman and Mr. Mullis was the railroad agent. The sawmill ceased operations in the early 1920's due to lack of timber. When the mills around Ehren shut down, this engine was abandoned. Note that it looks very much like the engine on the left. Photo circa 1927. 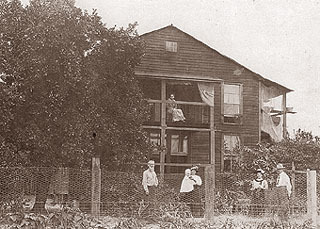 Mary Whitman sits on her upstairs porch while her husband Thomas stands at the fence (at left.) Click on Mary & Thomas to see close-ups. Stemper got its own still and the Stemper Turpentine Company along with the Peninsular Naval Stores and Consolidated Naval Stores companies became the major industry in the area. The Naval Stores companies produced turpentine and rosin products which were widely used in the shipbuilding industry. The rosin was used to caulk seams and turpentine was used as a paint thinner. From 1899 to 1913, the Stemper post office would be discontinued and reinstated two more times with postmasters Edward S. Hall (1905), George S. Petteway (1906), Millard W. Thompson (1906), Ogden Haynes (1907), James C. Patterson (1909), Emma Smith (1910), then George Sibthorpe on March 25, 1912. Hall, Petteway and Patterson were also affiliated with the turpentine and lumber companies in the area, their names appear on some of the recorded company lease agreements. The lumber boom of the late 1800's and early 1900's spawned numerous sawmills in the area, with much of Hillsboro and Pasco County covered in pine trees. 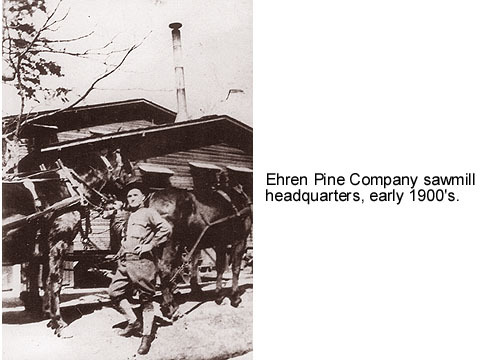 Several mills were located in the northern Hillsborough County and Stemper area, but the Ehren Pine Company in Pasco County was the largest. Numerous tram tracks crossed the countryside in northern Hillsboro and Pasco Counties, connecting the various sawmills with surrounding areas. Around 1900, the closest thing to roads in the area were trails made by stagecoaches, turpentine carts and wagons. Carts hauling resin to turpentine stills wore paths that crisscrossed the area, connecting stills in Ehren, Wesley Chapel, Nowatney and Stemper.